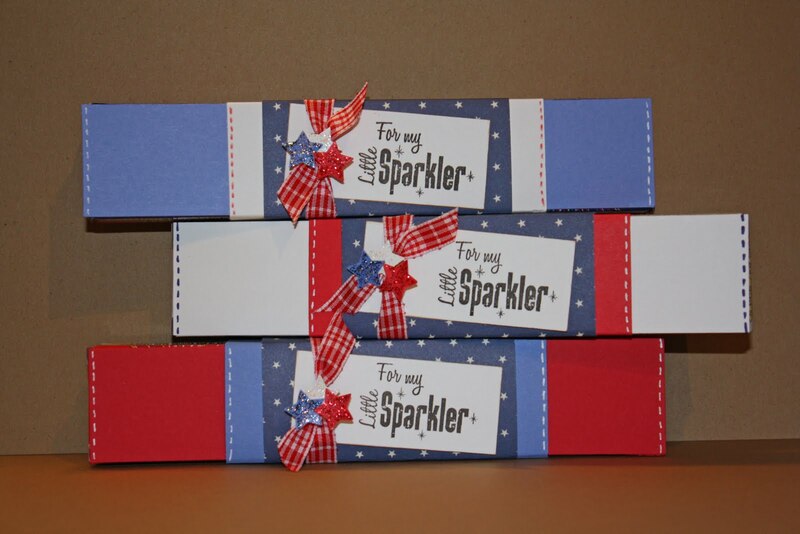 Terrific Tuesday Chanllenge - Stand and Salute! 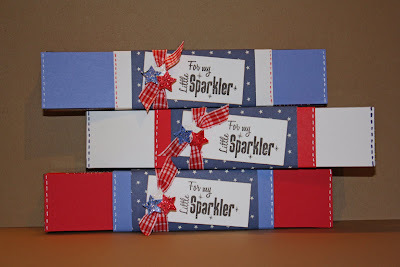 This week's TTC cart is Stand and Salute - I don't use this cart nearly enough! It's got some really great cuts, hopefully this challenge will inspire you to take another look at Stand and Salute. 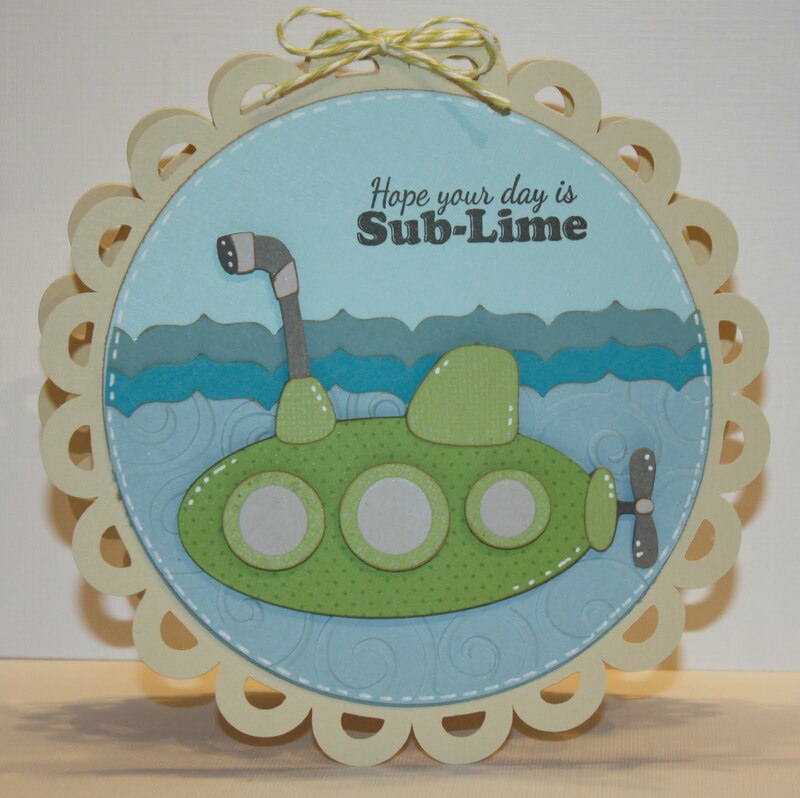 Hope your day is SUB-LIME! 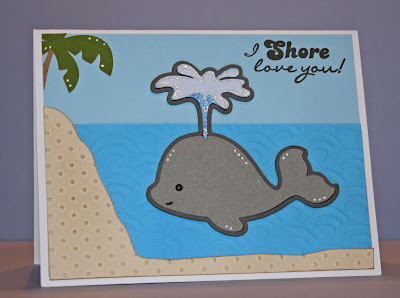 The base is from Sugar and Spice, I used the Fiskar's Upper Crest border punch for the waves and the sub is cut from Lettering Delights Seven Seas file. 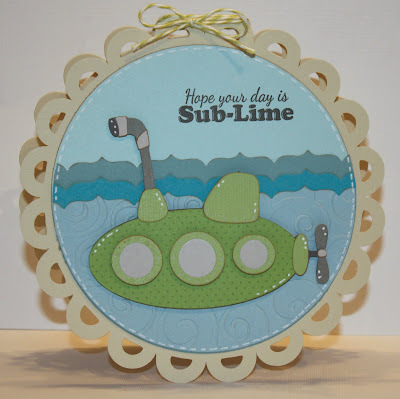 I embossed the top wave layer with Devine Swirls by Cuttlebug. 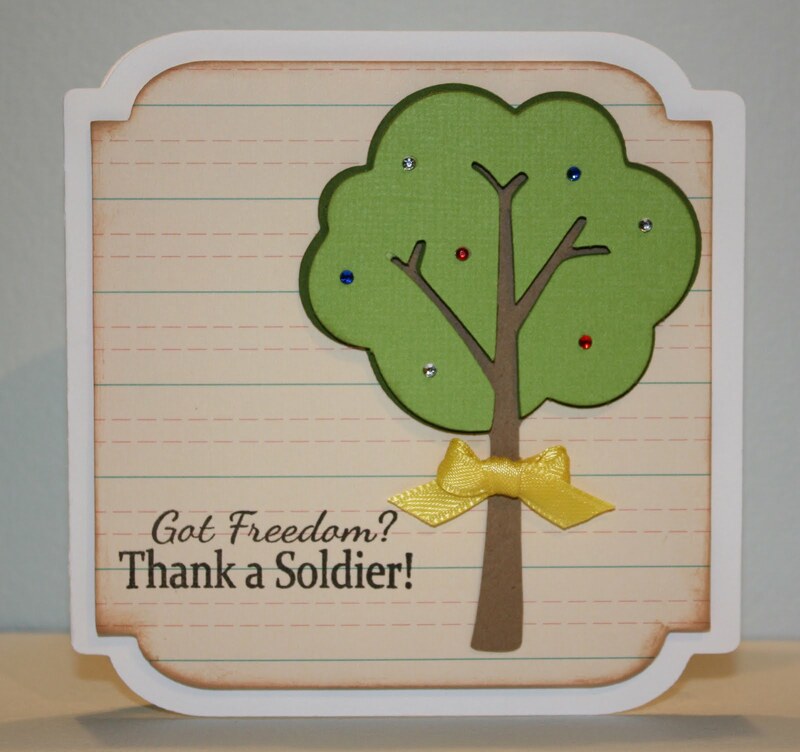 Sneak Peek #4 - Thank a Soldier! I have one more card for you tomorrow to finish out the Sneak Peek Week (say that 5 times fast - LOL) - hope to see you then! 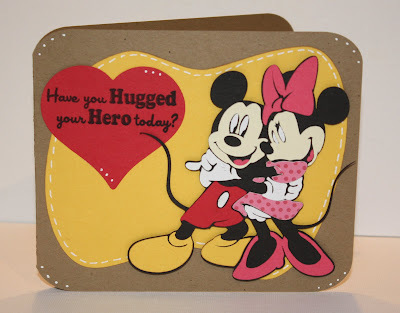 Sneak Peek #3 - Have You Hugged Your Hero Today? For this "simple" card I used a funky retro shape from Nifty Fifties, and Mickey/Minnie from Mickey and Friends. The heart and base are from Lacy Labels. 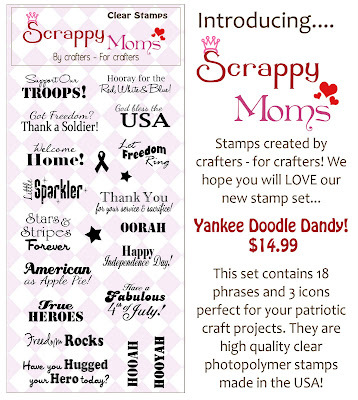 The outside sentiment is from our new Scrappy Moms Stamps Yankee Doodle Dandy set and "Happy Fathers Day" is from SMS All in the Family. Yesterday was my little guy's 3rd birthday party (today is his actual birthday) so I didn't get a chance to get this project finished and posted - sorry for the delay. I used red/white gingham ribbon to tie a little bow and added 3 little stars I punched out on top of the knot. A little Stickles adds some bling! 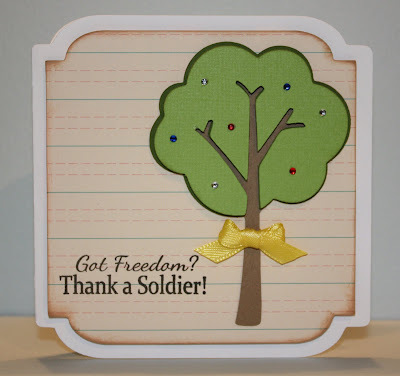 On the tag I used "Little Sparkler" from Scrappy Moms Stamps new Yankee Doodle Dandy set and "For my" from SMS All in the Family set. Hope you enjoyed my little project for the day! Thank you for stopping by! 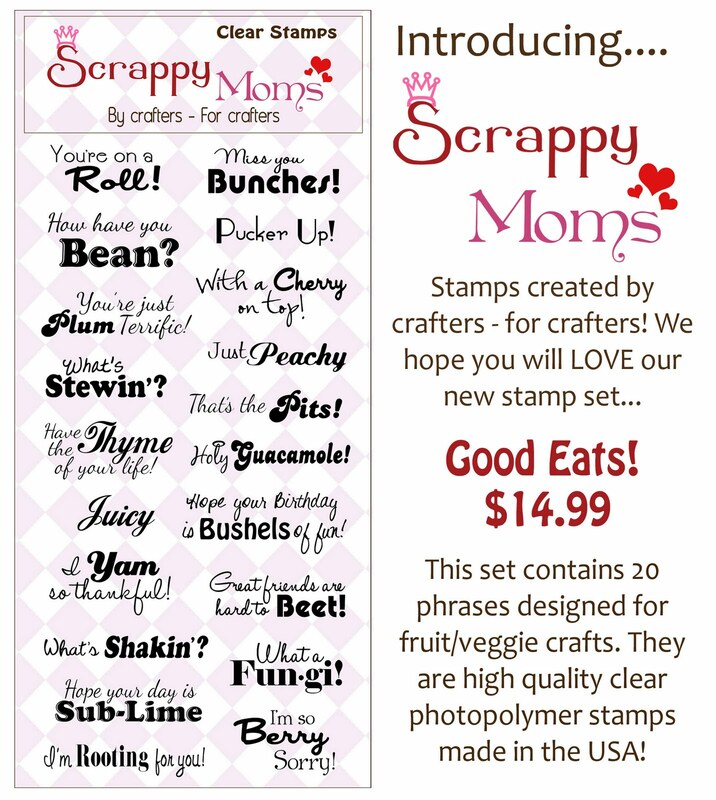 Two New Scrappy Moms Stamps Sets! 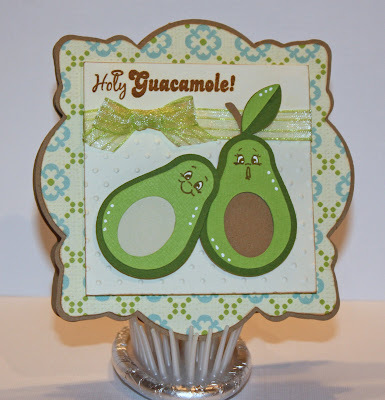 The little avocados are cut from Preserves - I skipped the base layer on the little guy and cut off his leaf. The base is from Lacy Labels, I welded 2 together and cut a third one so that the top arch wasn't flat. 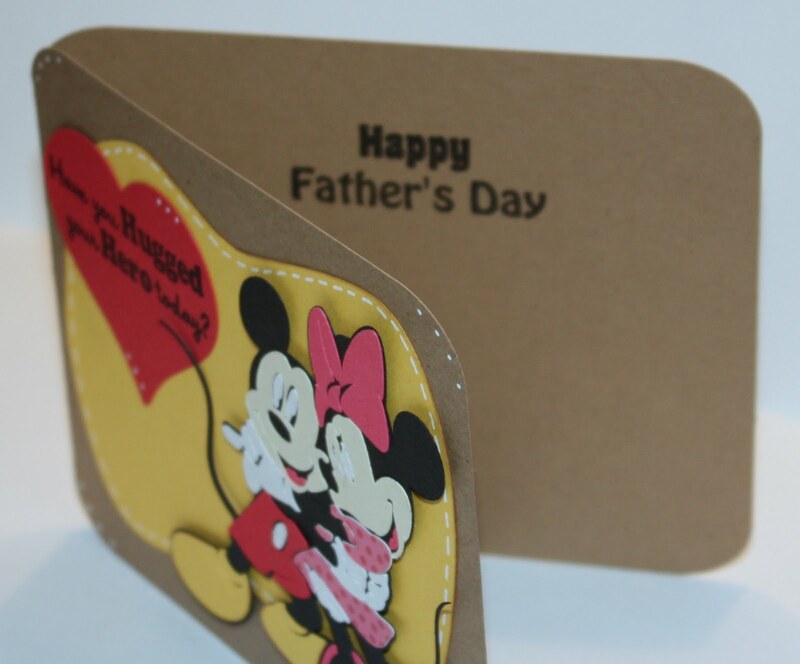 The cream square is embossed 3/4 of the way up with the Cuttlebug Swiss Dots embossing folder. Can you tell I'm addicted to this sheer, striped ribbon from Michaels? It's sparkly and I bought a roll in EVERY color - your sure to see it often. LOL I used PKS Everyday Character Faces and the sentiment is from our new SMS Good Eats set. Terrific Tuesday Challenge - Sweet Treats! 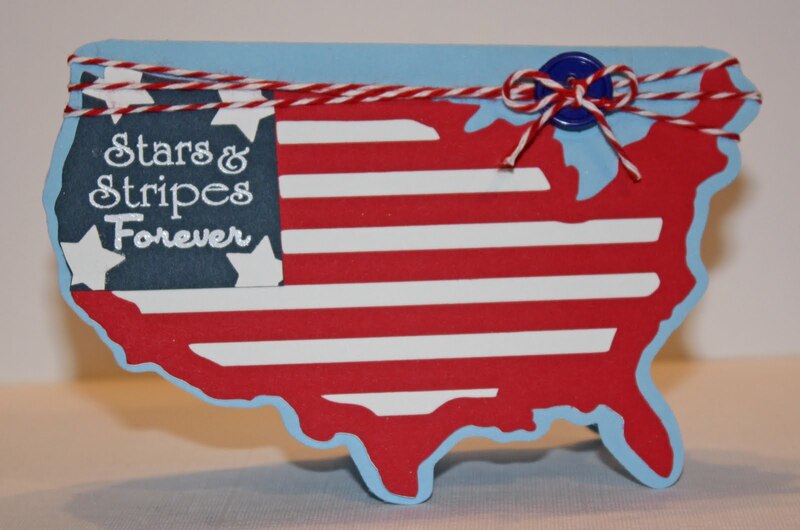 The base of the card is the stamp cut from Sentimental - I welded 2 together. 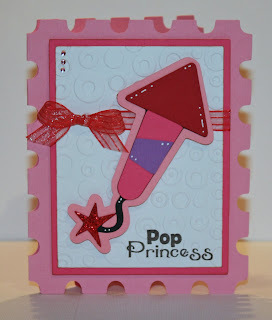 I used the Dots and Spots embossing folder by Cuttlebug, red Stickles, and some tiny gems to give it some pizzazz. 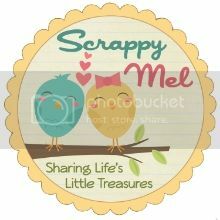 The sentiment is from Scrappy Moms Stamps Happily Ever After set. I hope you like my project for this week. Please come by and play along with us! 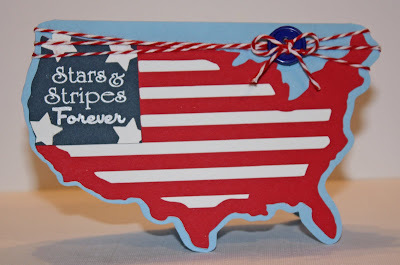 Scrappy Moms Stamps 1st Birthday Blog Hop!! I hope you enjoyed my project! Your next stop on the hop is Laura. 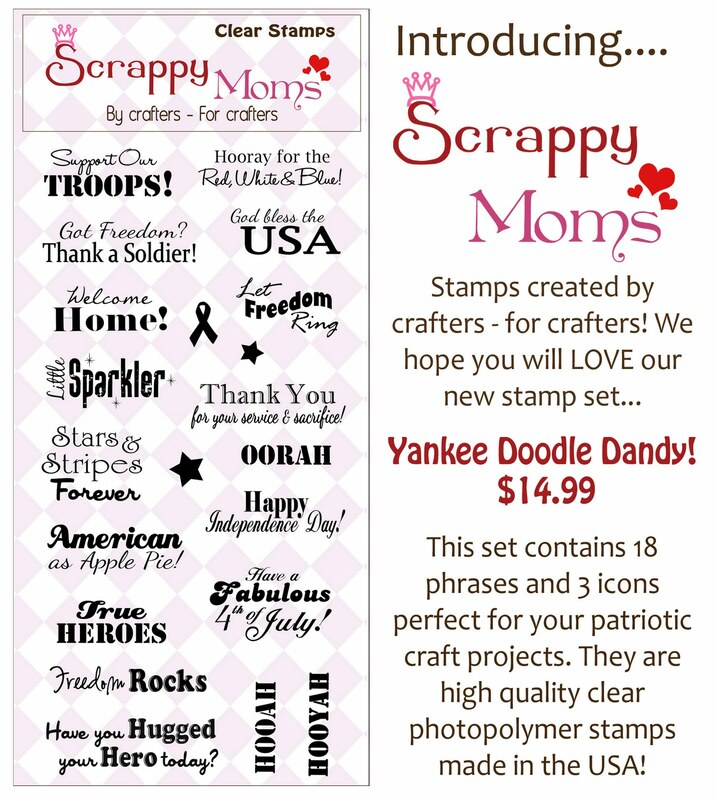 Thank you for joining me to help celebrate the 1st Birthday of Scrappy Moms Stamps! 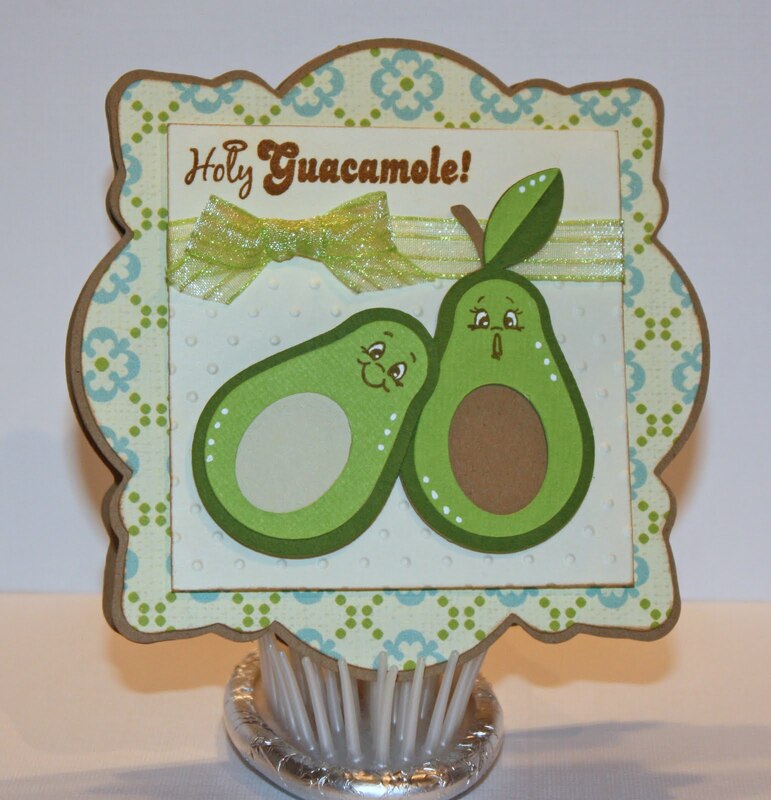 I can't believe it's been a year since Tammy and I started our little stamp company. Thank you to all our FABULOUS customers - without you it never would have happened! I made a brand new project for you today using one of my favorite SMS stamps set - The Charmed Life! 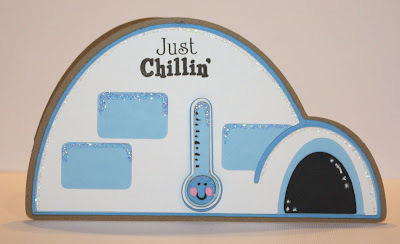 I used the Eskimo Kisses SVG file from Lettering Delights and for my igloo and thermometer. I use 2 shadow layers to create the shape-card base. I used lots of Stickles (Waterful and Icicle) to give it some frosty sparkle! Anyhow, thank you again for stopping by! 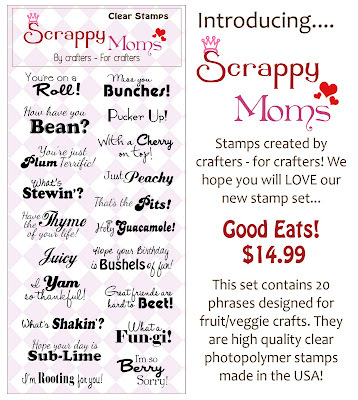 Be sure to visit the Scrappy Moms Stamps Blog and leave a comment for a chance to win a SMS Spring Fling stamp set!